Well I tried to freeze the rhubarb, really I did, but I just couldn't stop myself from testing out 2 more recipes using this colorful amazing vegetable. It's almost as if I personally discovered rhubarb all by myself and I need to see how many ways I can create with it ! 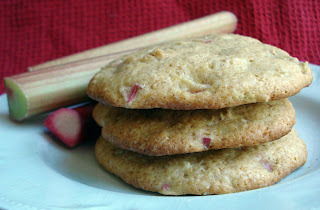 So in my last post I kiddingly mentioned rhubarb cookies but, turns out, there are several recipes I found for them. After checking out this site http://www.savor-the-rhubarb.com/rhubarb-cookies.html I baked the Rhubarb Cookies with Orange. These really were delicious cookies. I made one change, however. I added 1/4 tsp. of ground ginger. After reading a lot of rhubarb recipes I noticed many of them called for ginger so I decided to use a little bit and I think it added a nice extra spice flavor. Also, when I make these again, I would use 2 cups of chopped rhubarb rather than 1 1/2 cups. I felt it just needed a bit more. The cookies come out soft, kind of cake like and because of this, they would make terrific sandwich cookies, kind of like whoopie pie like...OMG.. whoopie pie rhubarb cookies !! Somebody stop me!! 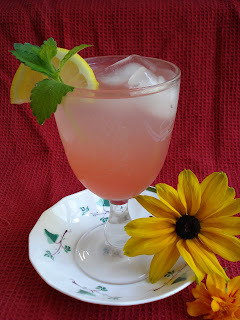 The next rhubarb recipe I made (from the same web site), was Rhubarb Lemonade. Okay, this drink is so good!!! You have to make it...you just do!! Because my rhubarb was so fresh, the amount of sugar called for in the recipe was a little too much. I would cut down the sugar if your rhubarb is growing in your garden and nice and tender like mine was. Well, there you have it! All my rhubarb is gone and I need to move on! I've been gathering blueberries everywhere and freezing them. Between picking them myself and buying them at the farmers markets, I have quite a stash. Stay tuned for something blue...berry that is! Gnocchi...With a French Twist !! Wicked Good Pumpkin Whoopie Pies !! A No Baking Day...well almost ! Whoopie ! !...pies, that is !! NYC and The Fancy Food Show...Bobby Flay ! !